This super-simple rhubarb chutney recipe comes from The Great Book of Rhubarb by Elaine Lemm and is based on a recipe which belonged to the mother-in-law of a Yorkshire based foodie. Anne Smith, and you can read all about her at the end of the recipe. This is one of the easiest chutney recipes we have come across and literally requires placing on the stovetop and being allowed to plop away (plopping being the noise it makes as it cooks). You can use outdoor-grown rhubarb for the recipe as the thick stalks cook down really well and have a more robust flavor, but it works very well with new season forced rhubarb resulting in a lighter colored and flavored chutney as well. Bring all the above to the boil. Reduce heat. Pour into clean sterilized jars, put the lid on and store. Has a long store cupboard life. 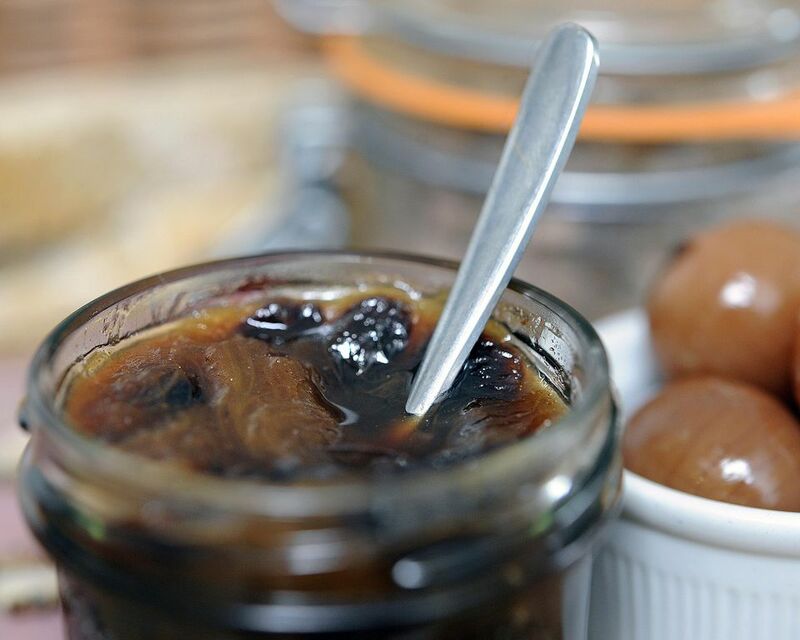 The best way to cook this chutney is in a large non-reactive or stainless steel pan, keep an eye on the chutney to make sure it is not burning at the bottom. This amount of chutney takes about an hour to cook and fills 6 one pound (450g) jars. The rhubarb chutney will keep for several months in sealed jars kept in a cool place but it is not necessary to put it in the fridge only once it is opened. Not sure what the difference is between raisins and sultanas, find out here. It is imperative to sterilize jam jars so they are clean and sparkling for the chutney. Unclean jars will reduce the shelf life of the chutney. The best way to serve Plopping Away rhubarb chutney is best served alongside cold meats, cheeses, and pies and a star on the Christmas table and especially good with pork pie and a good British cheeseboard. Ann Smith, keeper of the 'Plopping Away' Rhubarb Chutney recipe was a real character, known affectionately as Miss Marples, with her direct manner and keep-out-the-rain tweed hat! She was a really canny Yorkshire homemaker, as well as an all around great mom and grandmother. This recipe has traveled happily along the generations of the Smith Family, with her granddaughters Annabel and Abigail carrying on the annual tradition of The Rhubarb Chutney making, following the lovely handwritten, now rather sticky, recipe card instructions! As wife to her son Mike, I am an honored sharer of the chutney making team. I look forward each year to using the rhubarb that was transferred from one garden to another, to keep the deemed to be circa 100-year-old rhubarb on the go, and keeping the store cupboard topped up with chutney. Recipe courtesy of Irene Myers"